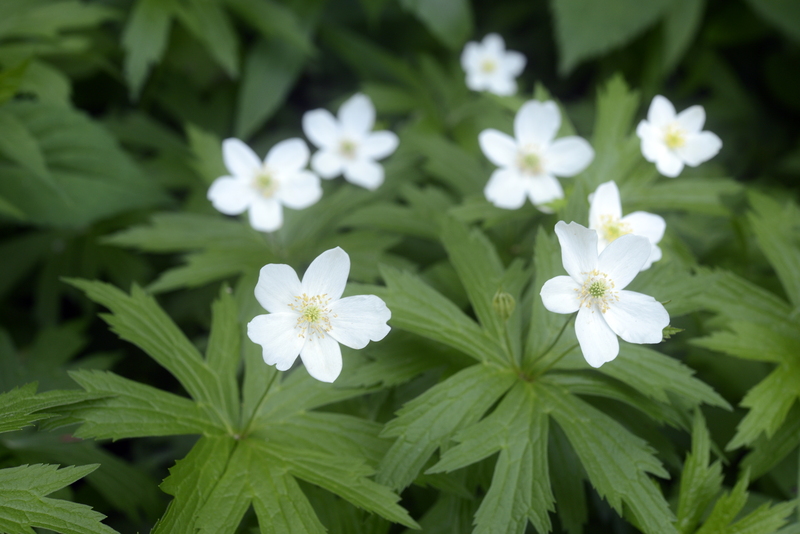 The highlight of the late-spring shade garden is Canada anemone (Anemone canadensis), a plant that spreads a bit too enthusiastically. 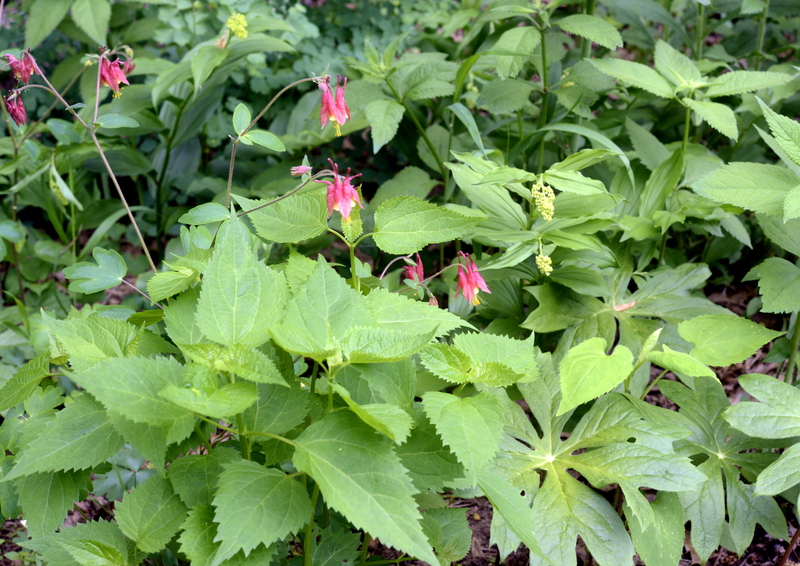 Also in bloom are columbine, native geranium, and Virginia waterleaf. It looks like the sweet joe pye weed will be as tall as it was last year. 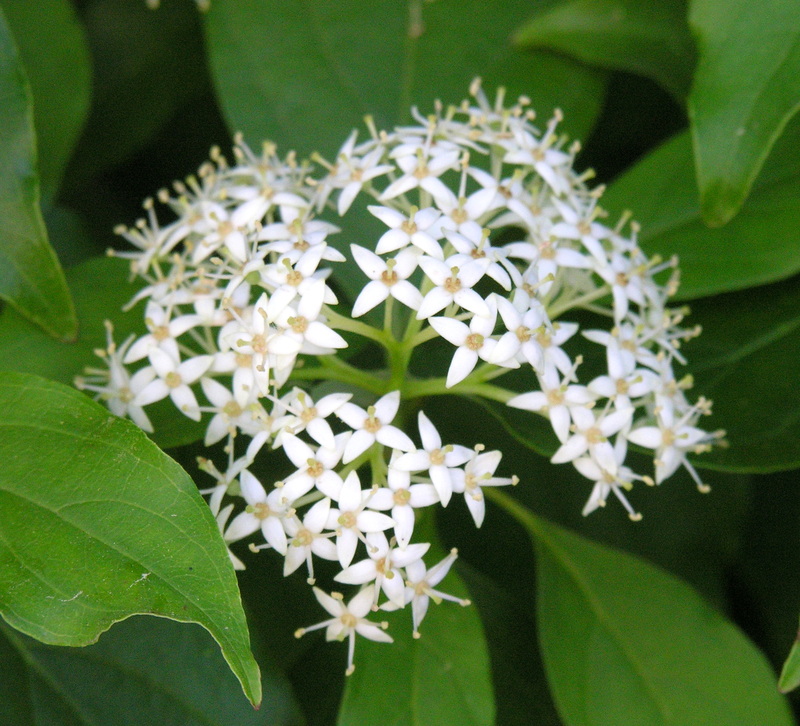 Late spring ushers in lovely blooming shrubs: ninebark, grey dogwood, and, very soon, elderberry. The first summer perennial–in my garden, that means Penstemon digitalis–is just open, and many others are showing buds. All the vegetables are planted. Because it’s been so dry, there’s not much weeding to do. It’s almost summer! — water new plantings: Water the plot thoroughly before planting, and give all newly installed plants a good soaking as soon as you put them in the ground to settle them in and eliminate air pockets in the soil. Any week in which we receive less than an inch of rain (like this week and the past three weeks), water all woody plants installed this spring or last season. Perennials planted last spring should be well-established, but those planted last fall and this spring need supplemental watering during dry spells. How do you know when we’ve received an inch of rain? I use a highly sophisticated rain gauge–an old yogurt container placed on the ground among the plants. A tunafish or catfood can works equally well. — harvest early greens such as lettuce, spinach, arugula, mustard greens, and mesclun mix, plus peas and radishes. As greens bolt, or go to seed, pull the plants and plant something else. A row of beans, perhaps? — If you started warm-season crops indoors, set them out in the garden now. It’s finally time to set out your tomatoes, peppers, squash, eggplant, beans, and cucumbers. — now that all perennials have emerged, move and divide plants as necessary. This is the best time to divide perennials: root systems are small and easy to handle, and plants recover fastest this time of year. But be sure to water the plot before doing any planting. The soil is very dry. — it’s not too late to extend a garden bed or start a new one, and it’s always a great idea to eliminate some lawn: spread a 3-4 inch layer of cedar or hemlock bark mulch over the area now to kill the grass. Then plant right through the dying grass and mulch. — follow a sustainable lawn care regimen: if you feel you must fertilize your lawn, best practice is to give it no more than two applications of slow-release organic fertilizer each season, around Memorial Day and Labor Day. If you reseed bare areas, be sure to water often, especially now that the weather is hot. Lawn grass is really adapted to a much cooler climate than outs. Better still, if you have a place where grass won’t grow, plant something that will, like shade-loving native perennials. Lawns do not need water now (or ever), but if you do water, do it infrequently and deeply to encourage deep root growth. One inch of water once a week is much better than a few minutes each day. But remember: the more you water, the more you’ll have to mow! A detail of that lovely anemone. If you plant it, be sure it has room to spread. Flower cluster of grey dogwood (Cornus racemosa), the loveliest dogwood of all. One of the highlights of my vegetable garden is rhubarb, and usually I harvest the first batch of stalks around this time of year. I have five plants: three are large enough to harvest, and the other two are small divisions made this spring. I started with two plants three years ago. It seems that you can just keep dividing the plants forever. Rhubarb (Rheum rhabarbarum) is a member of the Polygonaceae, like some of our most aggressive alien weeds (Japanese knotweed). Also in this family are a number of useful edible plants, such as buckwheat and sorrel (also in my vegetable garden). Rhubarb is, of course, a vegetable, although we usually sweeten it and treat it like a fruit. Only the stalks are edible, and they are very, very bitter. Combine water and sugar in a saucepan with a lid and make a simple syrup. while the syrup is coming to a boil, cut the rhubarb stems in 1/2-inch slices. Add them to the syrup and cook them uncovered until you like the consistency: the longer the cooking time, the smoother and thicker the sauce. Turn off the heat and add some grated ginger or orange peel, or, best of all, cut up 1 pound of fresh strawberries and add them. Cover the pot a leave it off the heat. The strawberries won’t quite cook through, but they will kind of meld with the sauce: strawberry rhubarb pie without the pie! Growing rhubarb, a perennial plant, is an example of permaculture, a philosophy geared toward obtaining food in a more sustainable way. Think about it: most of our food plants are annuals. Every year, you must prepare the soil, plant, till, weed, fertilize, harvest, remove the old growth, . . . Annuals need a lot of water and fertilizer, so growing them is not sustainable.In contrast, a perennial plant or fruit-bearing woody plant (hickory, elderberry, chokeberry) requires much less work and almost no inputs after you first plant it. It makes sense to rely as much as possible on hardy, long-lived plants. What to do with all your delicious rhubarb? The Smitten Kitchen website has lots of great recipes. 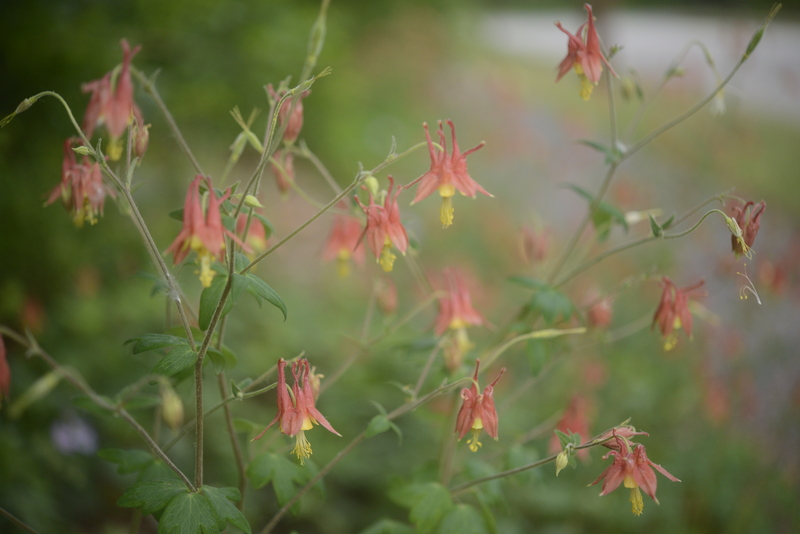 Our lovely native columbine (Aquilegia canadensis) is a highlight of a spring perennial garden. The drought continues! Despite all the predictions and lots of cloudy weather, we received well under an inch of rain this week, so the soil is very, very dry–unusual for this time of year. So watering new plantings is a high priority. Established plants, if they are sited properly, should not need supplemental water, however. — water new plantings: Water the plot thoroughly before planting, and give all newly installed plants a good soaking as soon as you put them in the ground to settle them in and eliminate air pockets in the soil. Any week in which we receive less than an inch of rain (like this week and the past two weeks), water all woody plants installed this spring or last season. Perennials planted last spring should be well-established, but those planted last fall and this spring need supplemental watering during dry spells. How do you know when we’ve received an inch of rain? I use a highly sophisticated rain gauge–an old yogurt container placed on the ground among the plants. — harvest early greens such as lettuce, spinach, arugula, mustard greens, and mesclun mix, plus peas and radishes. — follow a sustainable lawn care regimen: if you feel you must fertilize your lawn, best practice is to give it no more than two applications of slow-release organic fertilizer each season, around Memorial Day and Labor Day. If you reseed bare areas, be sure to water often. Better still, if you have a place where grass won’t grow, plant something that will, like shade-loving native perennials. Lawns do not need water now (or ever), but if you do water, do it infrequently and deeply to encourage deep root growth. One inch of water once a week is much better than a few minutes each day. But remember: the more you water, the more you’ll have to mow! Another highlight of the spring garden is native geranium, Geranium maculatum. This plant thrives in dry shade and goes dormant after blooming and setting seed. 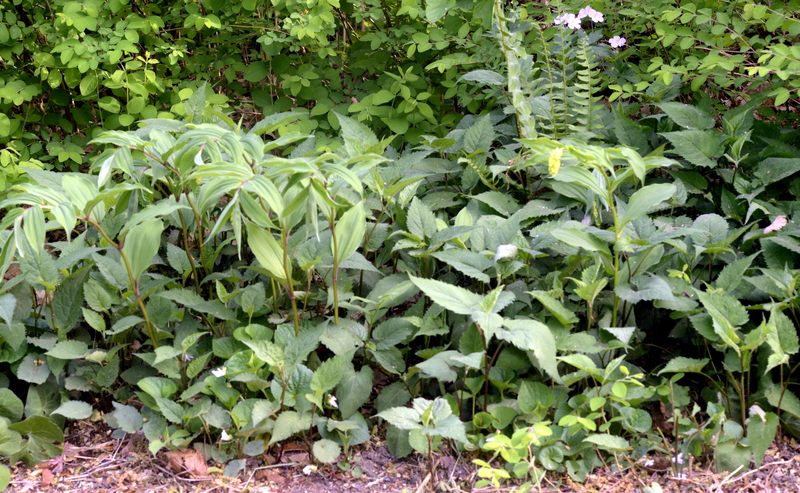 If I wanted to divide this clump of false Solomon’s seal or these shade asters, I would stick a spading fork in the ground and lift out part of the clump (although it would have been better to do it a few weeks ago when they first emerged). The essential tools for the home gardener include a trug to hold all the smaller items, gloves, a sharp knife, a hand fork, a trowel, a rake, a leaf rake, pruners, hedge clippers, a small hand saw, and, most essential of all, a spading fork. Barbara Damrosch, gardener extraordinaire, wrote a great essay about the spading fork. A spading fork is not a rake and it is definitely not a pitchfork. It is a long-handled tool with four heavy tines. You use it for loosening the earth before digging a hole, for lifting plants out of the ground, for loosening and removing turf, for dividing plants, for turning compost, for digging in compost, for digging up root crops. It’s much, much, easier to dig with a fork than with a spade. It’s always the first tool to use when you have to dig. It’s important to use a spading fork correctly. Suppose you’re digging up a large perennial: Place the tines as close as possible to the base of the plant and push straight down as far as you can. Then step on one side of the fork with the heel of your foot–not the toe or the instep–to drive it in as far as it will go. If you use your toe, you’re likely to slide off and fall down; if you use your instep, you can break your foot. Use your heel, which is strong and powerful, to push down as hard as you can. Then push down on the handle, lifting the tines, and the plant will most likely pop right out of the ground. If it doesn’t, repeat all around the plant, loosening the roots. Eventually the plant will come right out, the roots unharmed. Spading forks come in different weights and lengths. You want the heaviest one you can manage, and for length, you want the one that’s most comfortable for you. Be sure the handle and fork are attached firmly to the shaft–your fork will get a lot of heavy use. Take a look at this New Yorker cartoon about the spading fork on the Conde Nast website. Flowers of columbine and false Solomon’s seal, and foliage of mayapple, white snakeroot, several different shade asters, among others grace a shady perennial border. Mid-spring is my favorite time in my garden. The shade gardens in both the front and backyards burst into bloom, and although they’re not as colorful as the summer prairie gardens, they have their own quiet charm. As you can see, I like to plant many different species close together (it helps fool the rabbits and deer). In spite of the extremely dry spring we’re having, I have not watered these gardens. — the soil is very dry, so water new plantings: Water the plot thoroughly before planting, and give all newly installed plants a good soaking as soon as you put them in the ground to settle them in and eliminate air pockets in the soil. Any week in which we receive less than an inch of rain (like this week and last week), water all woody plants installed this spring or last season. Perennials planted last spring should be well-established, but those planted last fall and this spring need supplemental watering during dry spells. How do you know when we’ve received an inch of rain? I use a highly sophisticated rain gauge–an old yogurt container placed on the ground among the plants. — If you started warm-season crops indoors, set them out in the garden now. It’s finally time to set out your tomatoes, peppers, squash, and eggplant. — now that almost all perennials have emerged, move and divide plants as necessary. This is the best time to divide perennials: root systems are small and easy to handle, and plants recover fastest this time of year. But be sure to water the plot before doing any planting. The soil is very dry. — follow a sustainable lawn care regimen: wait until Memorial Day to fertilize. If you reseed bare areas, be sure to water often. Better still, if you have a place where grass won’t grow, plant something that will, like shade-loving native perennials. Lawns do not need water now (or ever), but if you do water, do it less frequently and more deeply to encourage deep root growth. Enjoy your garden this weekend! 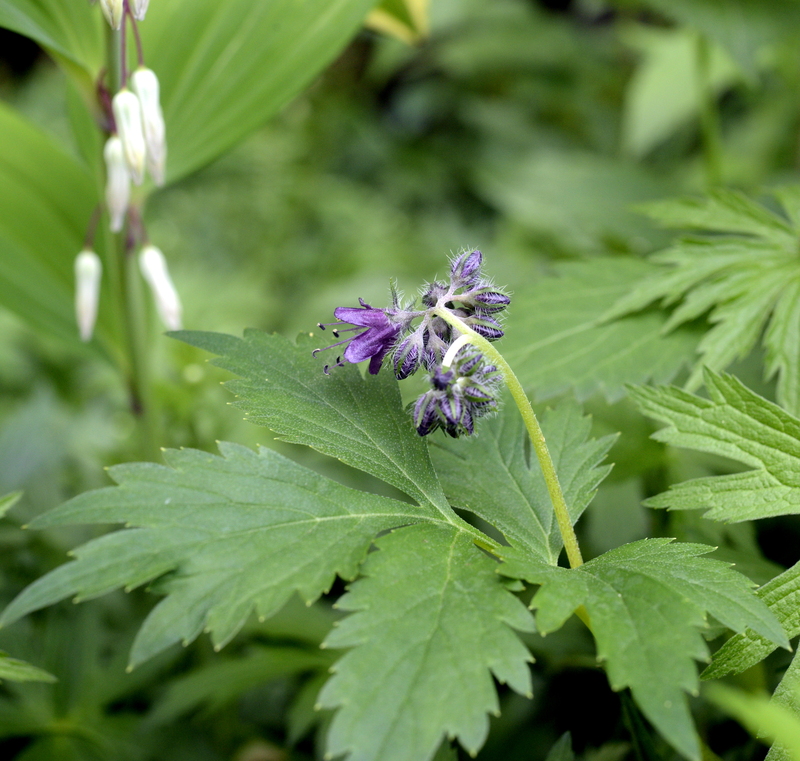 Virginia waterleaf, an excellent groundcover or flowering perennial for dry shade, opens its first flower; Solomon’s seal is in the background. Two similar and frequently confused plants are gracing my shade gardens right now: Solomon’s seal (Polygonatum biflorum) and false Solomon’s seal, sometimes called Solomon’s plume (Smilacina racemosa). You can see right away why Latin plant names really are less confusing than common names, right? Solomon’s plume (Smilacina racemosa). Notice the flower bud peeking out at the tip of the plant. Notice how similar the form of the two plants is. The flowers and fruit are totally different, but the size and shape, bloom time, and preferred site are all the same. Both are about 18″ to 2′ tall, bloom in May, and fruit in late summer. They belong to the same plant family, the Asperagaceae (asparagus family). You’ll frequently see the two together in natural areas, and when they first emerge they can be hard to tell apart. Both spread by rhizomes. 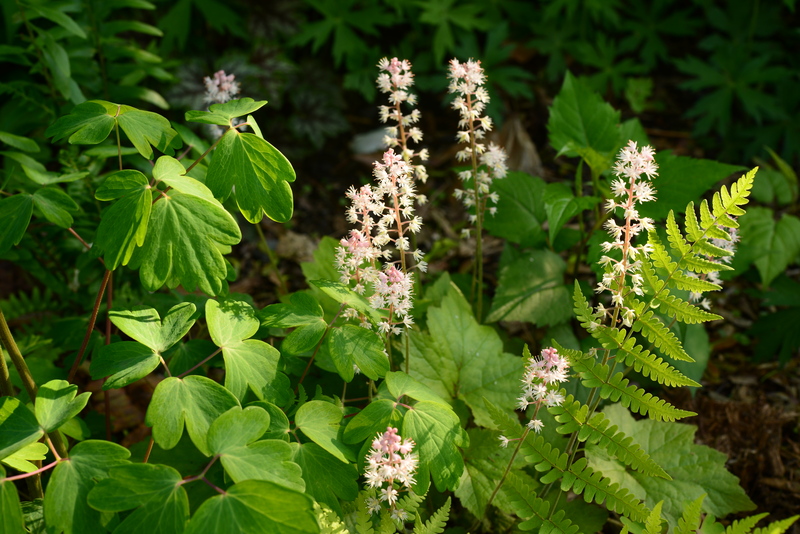 Both are shade plants that do best in damp, rich soil; although both do well in my dry, sandy soil, I suspect they would spread more quickly in richer soil. 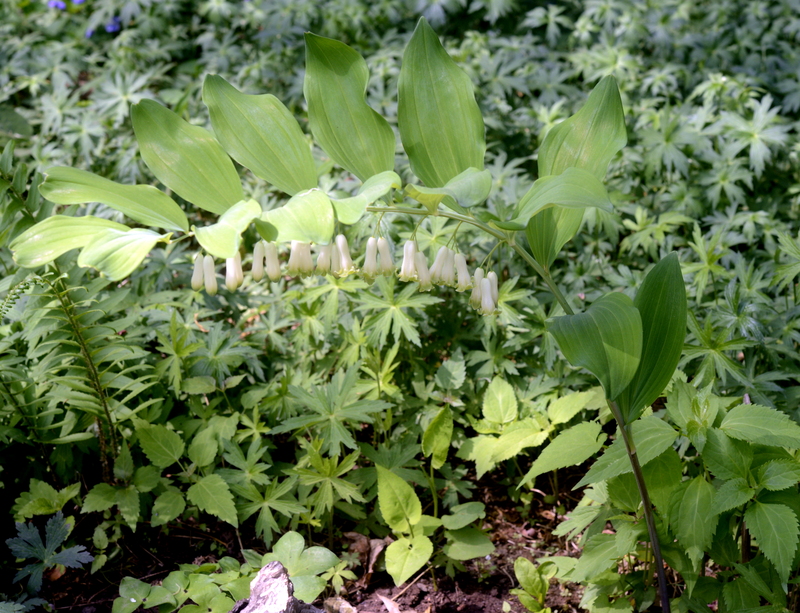 The dangling white flowers of Solomon’s seal will turn into blue berries in late summer. The white plumy flowers of false Solomon’s seal will turn into clusters of bright red berries that the birds will eat the second they ripen. 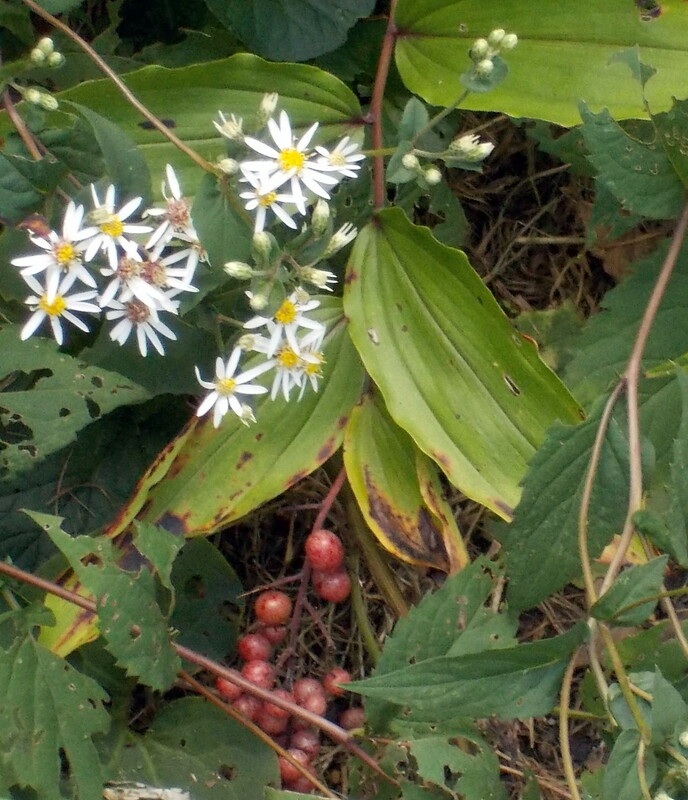 Here’s a closeup of the Solomon’s seal flowers and a not-very-good picture of false Solomon seal fruit. 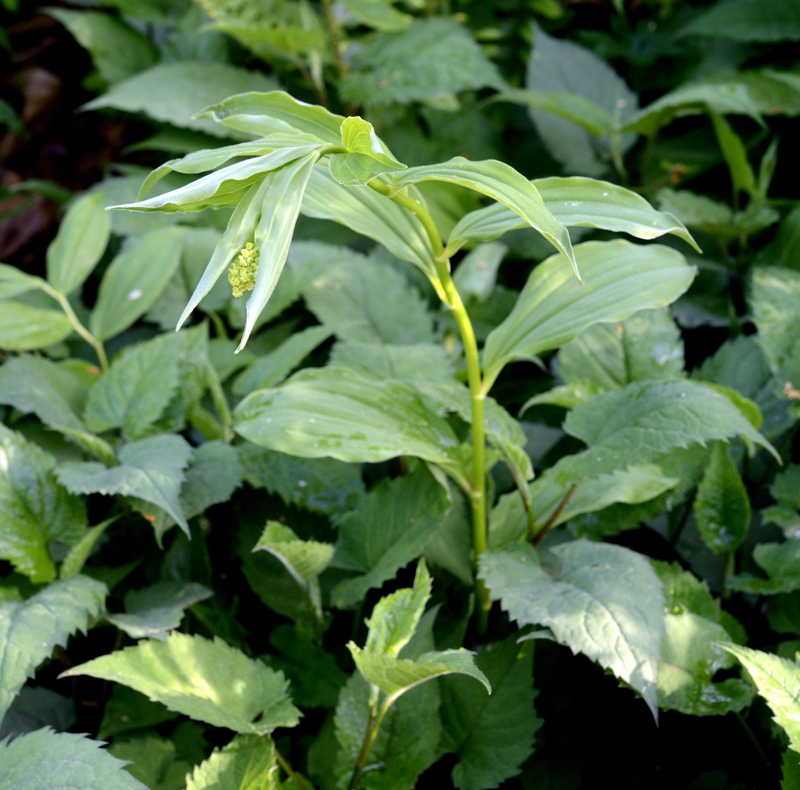 False Solomon’s seal–almost-ripe fruit in mid-September when the shade asters bloom. Both of these plants are relatively easy to find, as native plants go, meaning they are not that easy to find. 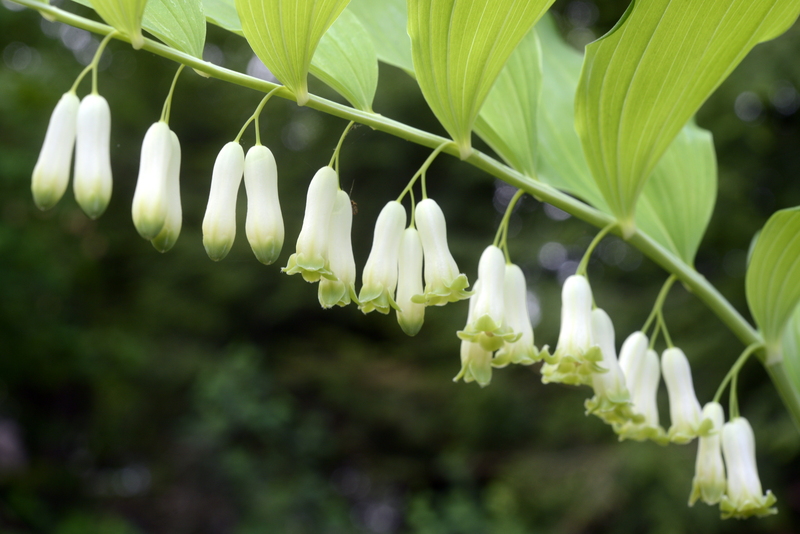 Avoid the commonly available Polygonatum odoratum, Japanese Solomon’s seal. Many garden centers and plant catalogs sell that, calling it simply variegated or fragrant Solomon’s seal. It is not a native plant. It’s worth seeking out the real thing! Remember to always check the name of the species. These two species are excellent choices for almost any shady spot. If your soil is moist, combine them with appropriate ferns, Virginia bluebells, jack-on-the-pulpit, golden alexanders, mistflower, even trilliums. If the soil is dry, try different ferns, mayapple, native geraniums, meadowrue, shade-loving asters. But do try them! 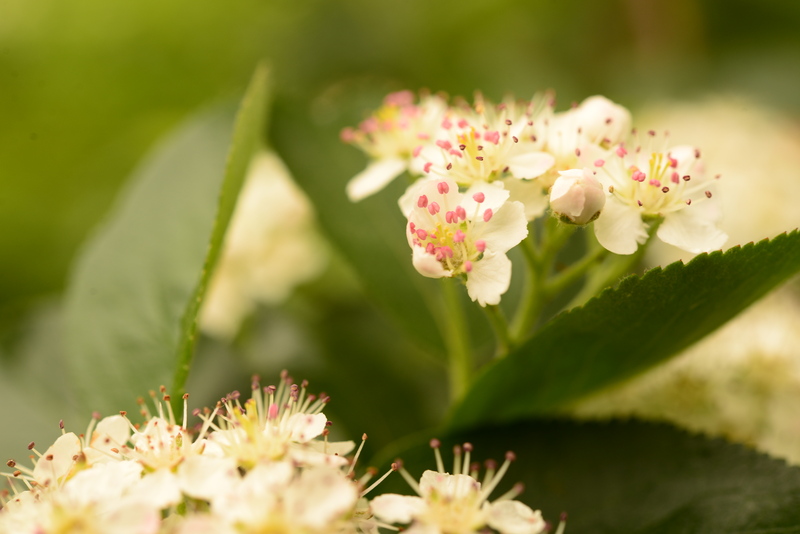 The exquisite flowers of chokeberry (Aronia melanocarpa) are in full bloom. In August, birds will be eating the large, black berries. I’m spending a lot of time right now finding native plants for clients. Because of the late spring, most nurseries will receive all their spring plant shipments this week and next week, so this is the time to get out there and ask local nurseries for native plants (you’re shopping for mom anyway, right? Go to the website of the Native Plant Society of NJ for cards you can print, fill out, and give to nursery owners to request specific native plants. If we don’t ask, they won’t know we want them! I’m happy to say that more and more local nurseries are stocking more and more natives, but there’s still plenty of barberry and purple loosestrife out there as well, so be careful when you buy. The spring is advancing fast. Serviceberry is finished blooming; flowering dogwood, lilacs, and crab apples (Mother’s Day plants) are just about at their peaks; ferns are unfolding, and many local flowering natives, like jack in the pulpit, spring beauty, trout lily, and Solomon’s seal, are in full bloom. This would be a beautiful weekend to explore a local natural area like the Thielke Arboretum in Glen Rock. 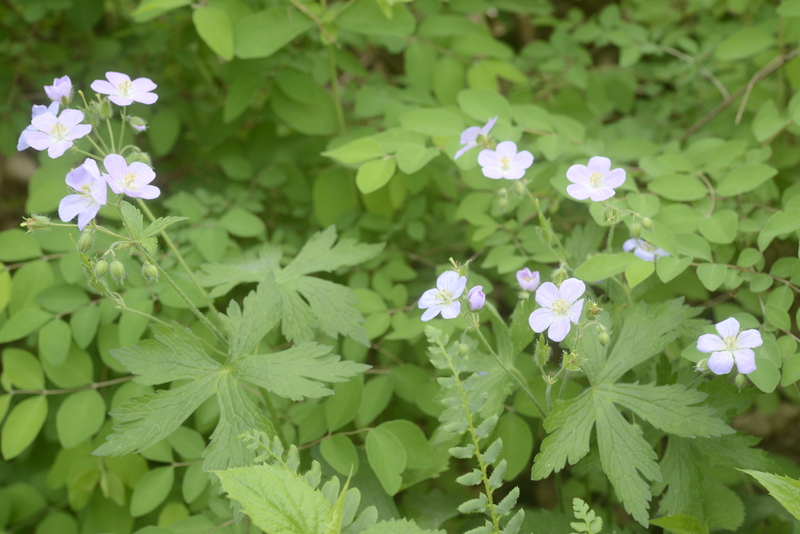 Take a walk in the woods, admire the native wildflowers, and notice the progress we’ve made in removing the garlic mustard over the past couple of years. (And if you see garlic mustard, pull it now. For the most part, it hasn’t set seed yet. — If you started cold-season crops indoors, set them out in the garden now. Wait until late May to set out tender crops such as tomatoes, peppers, squash, and eggplant. the nights are still quite cool. — now that most perennials have emerged, move and divide plants as necessary. This is the best time to divide perennials: root systems are small and easy to handle, and plants recover fastest this time of year. But be sure to water the plot before doing any planting. The soil is very dry. — evaluate the winter’s damage on your property. Don’t remove dead wood or broken branches unless they pose hazards to people or property, because they might be supplying food or shelter to winter-weary creatures, but see what needs doing. Do any areas need new mulch? Do your evergreens need spring pruning to remove winter damage? Do it as soon as new growth appears. — monitor your garden for bird activity. Birds are very active at foraging and nest building. If you’re not seeing this, maybe your garden lacks food. There should still be perennial seeds, berries of less desirable plants, and leaf litter and dead wood for the birds to search for insects. If you’re not seeing birds, consider what you can do this season to attract them: for example, plant native perennials, stop pruning dead wood quite so aggressively, stop using pesticides. Enjoy the beautiful Mother’s Day weather! Foamflower (Tiatella cordifolia) a diminutive groundcover, is in full bloom now. After the flowers fade, the variegated leaves will provide visual interest all season. On the left is a columbine, which is showing buds but isn’t quite in bloom yet.